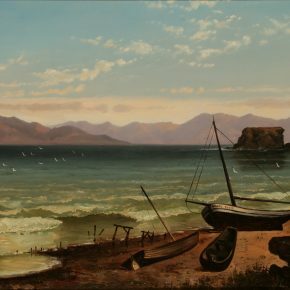 The nineteenth-century Utah artist Alfred Lambourne (1850-1926) loved Great Salt Lake. Nestled within a basin, the body of water he referred to as his “inland sea” was his source of adventure and joy, his faithful companion and as such, his preferred place for solitude. His relationship with the lake spanned decades, resulting in a body of work that rivaled and sometimes surpassed his contemporaries. Lambourne’s body of work was varied, as he sketched and painted the lake from multiple vantage points. 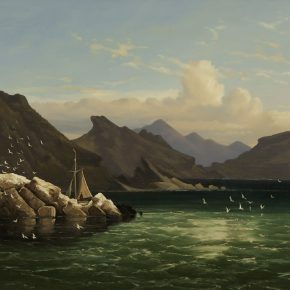 At the same time, his paintings focused on his favorite aspects of the lake: travel by boat, soaring birds, and of course the ever-changing water, sky, and atmospheric phenomena of the lake. Lambourne was an artist of many talents who began his career in Salt Lake City as a designer for Salt Lake Theater. He migrated with his family from England after they converted to Mormonism, arriving in Salt Lake City in 1866. Among his friends he counted the Hudson River School artists Thomas Moran and Albert Bierstadt, regional painter James T. Harwood, and photographer Charles Roscoe Savage. He was facile in drawing and painting, including writing early in his career as yet another artistic expression. 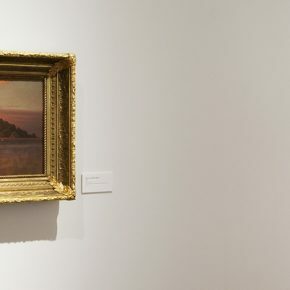 While his oeuvre stretched beyond Great Salt Lake, it is in the lake we find Lambourne’s passion.|1| Walking through the splendid exhibition on view at the Utah Museum of Fine Arts, The Savage Poem Around Me: Alfred Lambourne’s Great Salt Lake, one may wonder who Lambourne intended as the audience of his lake paintings. Today, we are fortunate to be that audience. Donna Poulton, the museum’s Curator of Art of Utah and the West, has assembled an exhibition that draws us in through beautifully preserved examples of Lambourne’s drawings, gouache, oil paintings, and books.|2| Each work is relational, complementing neighboring pieces, imparting a true sense of Lambourne’s talents. Some exhibitions can be appreciated no matter which work is viewed first. My recommendation is to follow Poulton’s lead and start at the exhibition’s entry room. Relying solely on Lambourne’s visual art and writing, no additional didactic panels are needed to appreciate the progression from the entry’s larger-than-life reproduction of Lambourne’s cabin on Gunnison Island (from a private collection in Oregon) to the small, stunning painting at the end of the exhibition. The entrée includes a few of the fourteen books Lambourne wrote, here specific to Great Salt Lake.|3| His major tome Pictures of an Inland Sea (1895; 1902) was published in final form as Our Inland Sea: The Story of a Homestead (1909), which Poulton drew upon for exhibition wall labels. 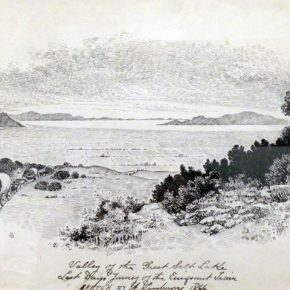 Another publication, A Glimpse of the Great Salt Lake is also included in several editions, one open to a page depicting one of Lambourne’s lake “Mirage Effects.” Book pages with their black and white illustrations may not initially draw viewers interested in color, but take a closer look. 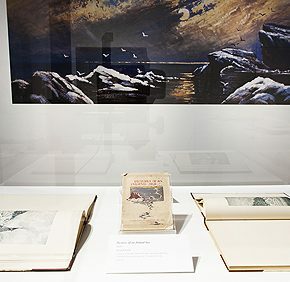 The exhibition’s tempera and gouache works were created then used as book illustrations. Displaying original grisaille (gray) paintings with their book counterparts provides us with excellent examples of Lambourne’s encompassing thought process. There is another phenomenon to be seen at infrequent periods on the Inland Sea, one that is unpaintable, and also, I believe, entirely local. It is to be witnessed during the calm summer twilights, when the pale, fairy-like tints on the water are breathed upon by opposite currents of languid wind. As they interplay in bands, in points, in shifting isles of amber, azure and rose, the whole surface shimmers and glistens like a silken robe studded with countless pearls. The rest of the works in the exhibition are paintings, varied in color, style, and mood. The horizontal orientation of Lambourne’s canvases echo the flat expanse of the lake, occasionally broken with vertical thrusts of mountains and precipices. There is an interesting rhythm to the way Lambourne constructed cliffs and walls of rock, revealing a consistent, underlying structure in geologic formations.|5| Lambourne relished familiar motifs: water, sky, cliffs, boats, and birds populate his works. An occasional person can be spotted, but they never serve as the focal point. Lambourne’s paintings have as their focal point something more nebulous, found in the rhythmic winds and occasional turbulent waters of the lake. It was motion and life embodied by the lake, I believe, that drew Lambourne to paint it over and again. Black Rock formation on the south end of the lake was a region Lambourne favored. 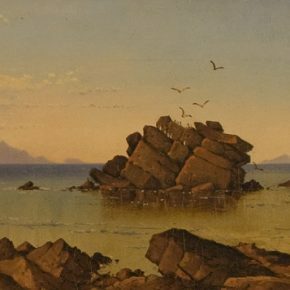 Poulton has placed three paintings of Black Rock next to each other, each showing the formation from a slightly different angle and mood. 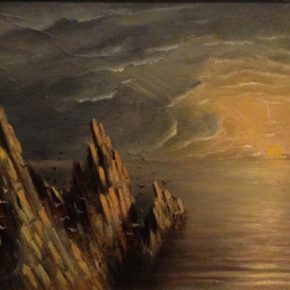 Not noted in the exhibition, but definitely noteworthy, is the recent restoration of the painting “Black Rock, Great Salt Lake” (ca. 1880).|6| According to UMFA’s Facebook page, this work was “selected by the UMFA docents as the recipient of their 2012 Docent Conservation Fund Award. This award allowed the painting to be shipped to and treated by the Western Center for the Conservation of Fine Arts (WCCFA). The need for treatment had been previously identified as part of an earlier docent conservation fund sponsored paintings survey, also completed by conservators from the WCCFA.” The painting is depicted half in its original state and half digitally restored in the Facebook post; seeing the actual painting in its full restoration is a highlight of the exhibition. The evening glow of the Western sky is particularly vivid, almost garish, in “Sunset on Gunnison Island” (1882).|7| One may assume Lambourne heightened and exaggerated the lake’s sunsets to the realm of the otherworldly. Today we may equate our Kodachrome sunsets to particulates and air pollution. If the sunset’s colors are a contemporary phenomenon, how did Lambourne “see” the same colors we witness in the western sky? His paintings show us what the Native Americans who lived around Great Salt Lake knew: the lake’s atmospheric inversions have always occurred in some form, due in part to a combination of the lake’s evaporating waters and its high altitude. My familiarity with Lambourne’s work was tested by the unexpected. There is a small canvas at the end of the exhibition, remarkable and unlike the other more polished lake paintings. Everything about “Untitled” (1880s) is different: the canvas is more square than horizontal; the paint application is looser and more impressionistic; the boats and people found in other paintings are absent.|8| This is raw nature, a little scary and rough, with rocky precipices reminiscent of the darker views from Romantic era landscapes. Lambourne’s paint application appears emotive as he depicts the emotionally charged sky bolstered by the blazing sun. The work of the American painter Albert Pinkham Ryder (1847-1917) comes to mind—an artist who, like Lambourne, straddled the shift from nineteenth to twentieth century, from realism to more emotional and abstract modernist tendencies. Lambourne’s unabashed adoration of Great Salt Lake is refreshing. I relished slipping away in time, thoroughly immersed in paint, color, motion, and emotion. Lambourne consistently layered paint, atmospheric effects, and influences in his lake paintings, taking us back in time through works that embody a specific time yet show influences and allusions to a new world just around the corner. 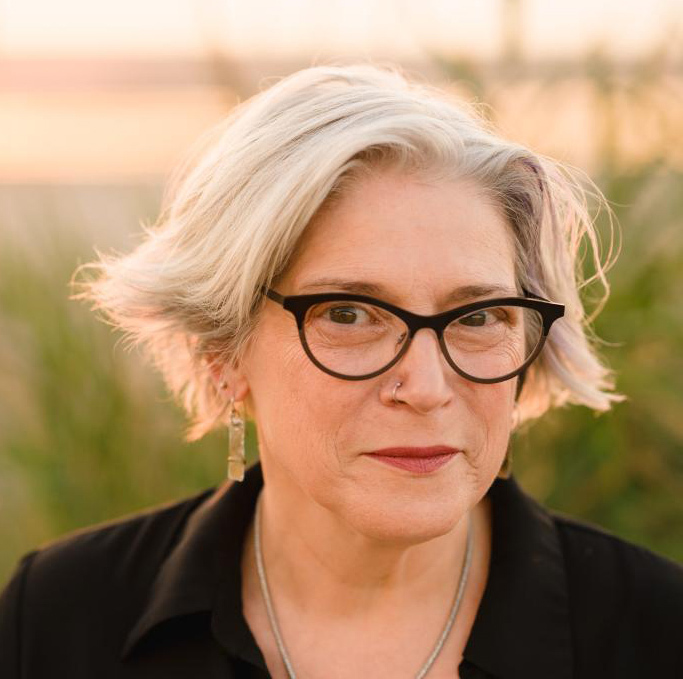 Great Salt Lake has been a subject of deep fascination for hundreds of years, and will continue to be so in upcoming exhibitions at Utah Museum of Fine Arts this winter and spring with contemporary art regarding Great Salt Lake. Until then, enjoy this fine view of our inland sea from the nineteenth century. The Savage Poem Around Me: Alfred Lambourne’s Great Salt Lake is at the Utah Museum of Fine Artsthrough June 15. Thank you Hikmet for such a well considered review and to 15 Bytes for all of the inspiring work you do. Your article on Alfred Lambourne was fascinating. He was my great, great uncle and I have always been impressed with his work. Both of my parents were born and raised in SLC and my father’s sister, Beverly Lambourne Olson is a very accomplished painter herself. My goal is learn as much as I can about Alfred Lambourne and eventually acquire one of his paintings, which rarely come up for auction.